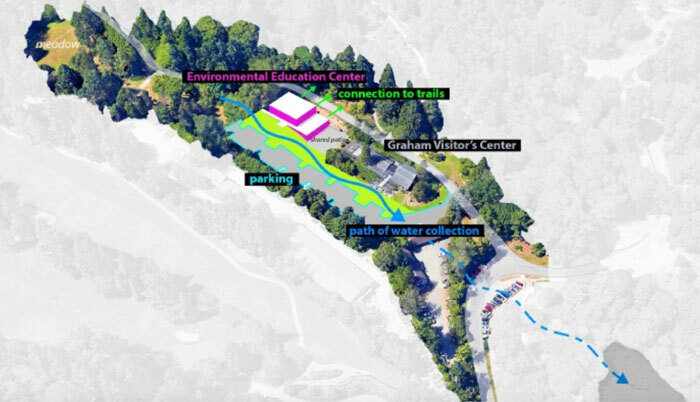 Image courtesy of Mithun: A linear site option for a new environmental education center next to the Graham Visitors Center in the Washington Park Arboretum appears likely to be tapped as the preferred location for future construction. A Master Plan Implementation Group will present a preferred option for building a new environmental education center in the Washington Park Arboretum in mid-February. The education center is a collaborative project between Seattle Parks and Recreation, the University of Washington Botanic Garden and Arboretum Foundation, all of who were represented during a presentation of three pre-design options to the public on Dec. 5. It’s now most likely that the preferred option will be to site the environmental education center — a fully green building that is its own learning tool — south and linear to the Graham Visitors Center. Assisting with pre-design work is architecture firm Mithun, which had suggested one of the site options be next to Duck Bay, said Michael Shiosaki, director of SPR’s Planning and Development Division. A wide intersection would need to be created on Arboretum Drive to accommodate buses turning around after dropping off or picking up students visiting the education center, and guest parking would be extended south; parking for four buses would be created on Foster Island Road. The Duck Bay option would also require relocating a maintenance shed near a southern meadow in the arboretum. The Arboretum Foundation will be tasked with leading the long fundraising campaign to make the environmental education center a reality. But the cost of moving the maintenance facility made it its own project, and MPIG is concerned about the added cost, said SPR project manager Susanne Rockwell. The Duck Bay layout would also require preschool children to cross a main vehicular entry point, creating safety concerns. “I would say, as we looked at pros and cons, that was a significant con,” Shiosaki said. The original concept was to move the greenhouse south of the visitors center anyway, which Rockwell said currently serves as a de facto education center, adding the linear option fits best with the master plan. An option to locate the education center to a southern meadow was also assessed as cost prohibitive, Rockwell said. A green pathway would be required to reach the meadow option, and utilities would also need to be extended from the visitors center to make a building there work. MPIG is expected to decide on a preferred option during its Feb. 1 meeting, and then Mithun will generate a design rendering to be vetted by the Arboretum and Botanical Garden Committee (ABGC) during its meeting 8:30-9:45 a.m. Wednesday, Feb. 13, at the Graham Visitors Center, 2300 Arboretum Drive E.
There will be another bid for a contractor to handle schematic design and development once fundraising is completed, he said. There will also be more community outreach at that time, said Rockwell, who expects fundraising to take a few years. Mithun will also generate an estimate for the project that will be used during the fundraising campaign. The education center is planned to include a rainwater collection system, a watershed education trail, digital energy-use displays and phytoremediation in the parking area — using trees and plants to clean up run-off before it reaches Duck Bay. If solar panels on the roof are not feasible, Shiosaki said, the roof could still be green. It’s unclear if the project can qualify for the Living Building Challenge green-building certification program, but plans are to submit it for consideration when complete.